After my trek to Har Ki Dun, I wanted to do some Treknic or some small trip. 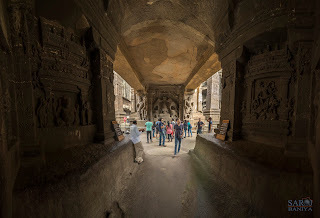 Then I got mail from Chaitanya telling “Exploring the Wonders of Ajanta and Ellora Caves”, since it was in my TO DO list I just registered immediately to the event. On 7th October our flight time was early morning 5.30 a.m. So with all confusion whether to go to airport on previous day night or early morning, I decided to go early morning since my place was near to airport. Few went to airport on the previous day night and few early morning, somehow we all managed to reach airport on the right time and started our journey with 2 different flights. By 7 we all landed in “PUNE” got fresh and started our journey to Aurangabad in a TT. 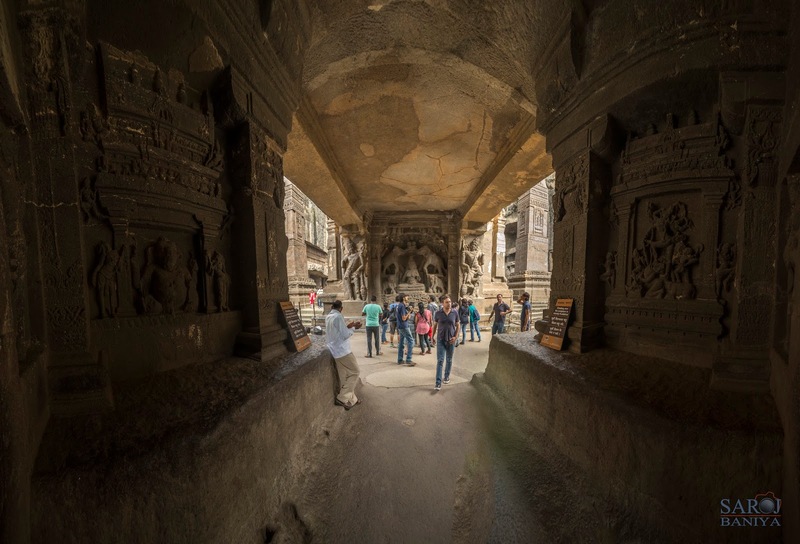 Our crew members who explored Ajanta and Ellora were :- myself, Chaitanya,Sushma, Geetha, Tejaswini, Shubha, Anshu(our little lady or model, singer, dancer of class 9th J so many names she has though) Abhinav, Saroj, Amit, Mahesh and Suresh. Day 1:- From Pune to Ellora. After getting down in PUNE airport we got fresh and boarded our TT which was waiting outside the airport. All were very hungry so there was a pin drop silent in TT. Chaitanya asked who’s not hungry. All were shocked to hear J because rats were running in everyone’s stomach. Around 30 mins of drive we got down at hotel. We all were looking for Vada Pav which is very famous in Maharashtra. We ordered Vada Pav, poha, sabudhana Vada (Yummy) and tea. With Vada Pav we got green chilies. I, Saroj and Abhinav had the first bite of chili. Omg it was spicy too spicy water was running from nose eyes everywhere but it was yummy. Later I didn’t dare to have it but Abhinav and Saroj ate it. But they also didn’t have much else we should have got Ice cream to both of them for next day morning (LOLJ). By 1 o’clock we reached Ellora caves. We had our lunch (Veg biryani) and then we entered Ellora caves. We took a guide with us since none of us were aware of Ellora caves nor its history. Let me start with a little history of the place. The actual name of Ellora cave is Verul, but it was difficult to pronounce for the British and thus was renamed as Ellora. 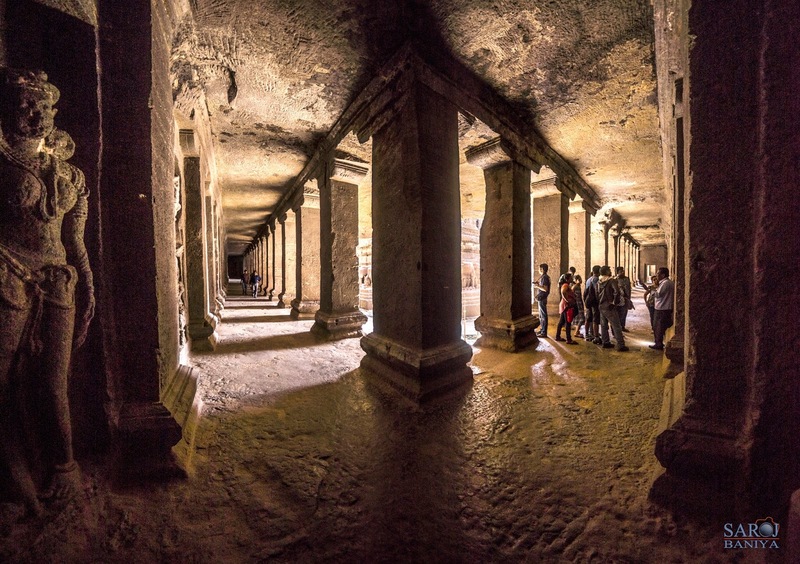 There are 12 Buddhist, 17 Hindu and 5 Jain caves containing rock-cut temples and monasteries. The Cave nos. 2, 5, 10 and 12 are of the Buddhist group, Cave nos. 14, 15, 16, 21 and 29 are of the Brahmanical group and Caves 32 to 34 are of the Jaina group is what the guide explained before we entered the caves. Once we enter we see “Kailashnatha Temple” at the entrance where they have maintained beautiful park in front of it. 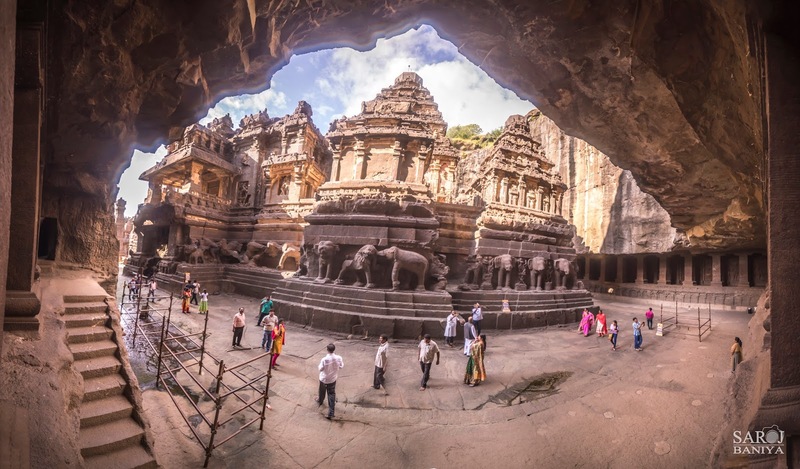 Main attraction in Ellora cave is Kailashnatha Temple. The Kailashnatha Temple is cave number 16 amongst the 34 caves of Ellora. Building the Kailashnatha temple self-consumed around 200 years to complete is what the guide tells. We took some photos and entered the temple. At the entrance towards our right we see “Lord Ganesh” and left we see “Maa Durga“ka sculptures incarnated on the rocks. Exactly on the opposite we see goddess Lakshmi with 4 elephants who’s doing Pooja by pouring water on her. The way they have incarnated it actually shows the waves of water and how the hairs of goddess has got wet. As we move on we can see so many statues of lord Shiva, Ravanasura, Mahishasuramardhini, Goddess Sarawasthi, Ganga and many more. We can see many avatars of lord Shiva incarnated. As we go further we saw Ramayana and Mahabharata also incarnated. There was also statue of Shiva Parvathi ka Panigraha where we can see the shy face of Parvathi incarnated so beautifully. We also saw idol of Ravanasura who cut all his 10 heads to worship Lord Shiva when he couldn’t find flowers, which was carved beautifully. Like this we saw so many beautiful idols of gods and goddess. Then we went inside the garbhagudi where we found shivaling which was very big in size. Every carving had its own story behind .It was very nice to hear such stories and see the carvings J.We spent almost 2 to 2.5 hours in Kailashnatha temple itself. After some photography we went to Buddhist caves. Buddhist caves are caves no. 2,5,10 and 12. These caves have big idols of Lord Buddha who is preaching Buddhism. Mostly here Buddha idols are in sitting posture. But Buddhism didn’t spread much outside because they don’t give equal respect to women is what we got to know from the guide. After visiting the magnificent Ellora caves, we went for Grishneshwar. This was just 1 or 2 kms away from Ellora caves. It is the 12th Jyotirling temple dedicated to Lord Shiva. The temple is built in Red Rock. We took darshan and left for hotel which was already booked. Around 7.30 p.m., we reached Hotel in Aurangabad. Same hotel was booked for next day also. Got fresh and went out to have dinner. Had tummy full of food came back and slept that night with a deep sleep, since was tired don’t even know when I got sleep. Day 2:- From Aurangabad to Ajanta. We got ready by 6a.m. early morning and started our second day journey to Ajanta caves. We had our breakfast on the way before reaching Ajanta. We reached Ajanta around 7.30 a.m.
After immersing ourselves in great architectural splendor at Ellora, we pushed off to the Ajanta caves. Unlike Ellora, your vehicle cannot directly take you to the caves. The caves are located inside the forest, where one cannot take their own vehicle. We need to alight at a particular point from where we are taken to the foothills of the cave by a special bus. The journey takes about 20 minutes and is a very interesting ride. The jungle environment definitely adds to the excitement. Once we descend from the bus, we need to do quite a bit of climbing up the hills to reach the caves. The pathway is a bit steep. But, once up there, one would realize all the pain was worth it. While Ellora was all about sculptures, Ajanta is all about wonderful arts it’s full of paintings. 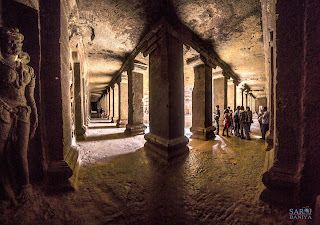 Ajanta caves, excavated in a horse-shoe shaped rock surface about 77 meters in height overseeing a narrow stream known as Waghora. Entire cave sight was simply incredible and I was happy to see what I had come so far to see. Here also we took guide and started to see and listen the history about Ajanta. We saw so many paintings of Buddha and his lifestyle. How he got enlighten under Bodhi tree was beautifully painted. We can see how King and Queen were dressed during those days. Ladies used to dress very beautifully and were also very pretty. Their hair styles, lipsticks, thin eye browse, their jewelry everything we are following it now. Same with guys, in painting I can see shaved head, people wearing Bermuda’s finger rings, checks shirts, stripe shirts all were fashion that time too. Most of the painting have got destroyed because of bats, few years ago since there was no electricity people used to watch the painting using lamps , the carbon which comes from those lamps have accumulated on paintings . Archeology department are trying their best to preserve paintings by doing so many research. We saw all the caves took photographs and around 1.30 we came out and had our lunch in Ajanta itself, since there are lot of good hotels around. After lunch we started our journey back to Aurangabad. Around 5 we reached “Suneri Mahal” but the Mahal was closed because it closes by 5. History about the Mahal has told by a local was King used to keep all his treasure below the Mahal. The height of the Mahal about the ground level, has been dugged below with same depth to store his treasure in those days. Now that underground place is filled with water and the entrance for that has been closed because it’s a very dangerous to go inside. We took one group photo and left from there to “Taj Mahal “I mean it’s a copy of Taj Mahal called “Bibi Ka Maqbara”. Around 5.45 we reached “Bibi ka Maqbara” has it is just 2 kms from “Suneri Mahal”. The Bibi Ka Maqbara was built by Azam Shah, the oldest son of Aurangzeb. This was his attempt to rival the Taj Mahal built by his grandfather, albeit in memory of his mother, Rabia Durrani, the first wife of Aurangzeb. Unfortunately, he lacked the treasury his grandfather had access to, as well as the skilled labor the treasury bought. Today, the Bibi Ka Maqbara is simply a replica of the Taj, and is popularly known as the ‘Deccani Taj’ – the Taj of the Deccan. We took some good photos went around Maqbara. It’s very beautiful. But place is bit crowded. We spent around 45 mins taking pics and chit chatting and then came out had Chats and came back to Hotel. Got fresh and had dinner at “Hotel Kailash” which is one of the best hotel in Aurangabad. Had nice dinner and also had a nice sleep since we were tired. Our 2nd day of trip of Ajanta came to an end. 3rd day we had only few hours of time since we have to return back to Pune which is of 6 hours journey. The last place which we visited on 3rd day was “Daulatabad Fort”. This fort was built by the Yadav King of Bhillama V in the 12th century AD. The fort was earlier known as Devgiri. It was rechristened Daulatabad by Sultan Mohammad-bin-Tughlak in 1327 AD. One thing worth noting about this fort is that it starts as a ground fort and ends as a hill fort. It has many walls built around it making it difficult for the enemy to encroach upon. We took the ticket at the entrance and entered the fort. It was full of walls. We took photos everywhere and then we reached a place where it was pitch dark. There was local person who works there. We asked him to explain why the place was so dark. Here is the story he narrated us: - When enemies entered the fort, in order to make them get confused and kill them they have made this particular place pitch dark. Once they enter the place they keep two entrance to get confused to go which side so that some will go one side and others will go other side. But within few footsteps they meet each other. Since place will be pitch dark they think its enemies and kill themselves. If they still go inside there also they have kept two entrance by the time the person decide which way to go they pour hot oil from top. If they miss that and go inside soldiers will be sitting on top once enemies enters they kill them by shooting. I really appreciate the technology they have used it. Once you cross all these then only you can enter the Mahal which is located at the top of the Mountain. We went to the top took some nice photos. There were so many squirrels feeded them some chips and then started descending from the port. Came down had sugar cane juice and started back our journey to Pune. For the first time in history of BTC we played UNO in TT. That was too funny. We were able to see cards of the next person. It was too fun. I still remember Suresh who used to always forget telling “UNO”, one time he told I know I know instead of UNO, LOL J we were laughing like hell. We reached Pune by 5.30 but our flight was at 7.45. We entered the airport got fresh. Did the feedback session and boarded our Bangalore flight. This is how our journey to Ajanta and Ellora came to End. I really want to thank Sushma and Chaitanya for organizing it. 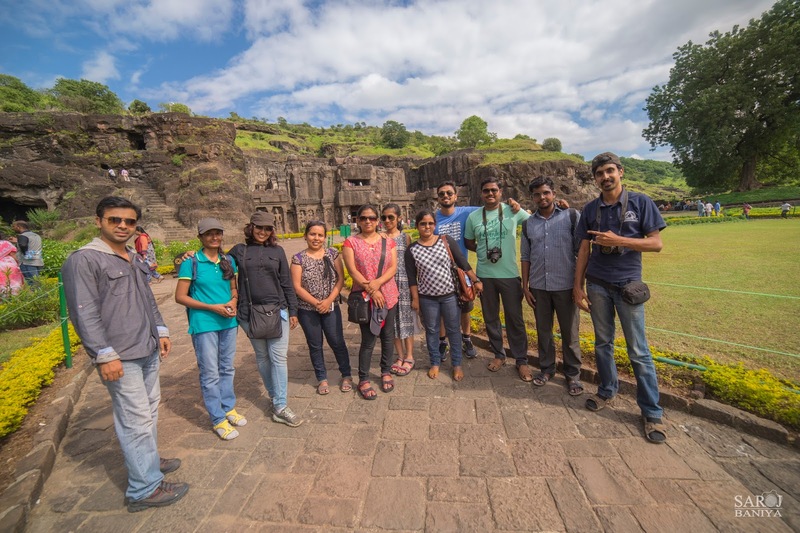 And also my special thanks to team for making my trip to Ajanta Ellora has one of the memorable one. Special thanks to all photographers (Chaitanya, Saroj, Mahesh, Abhinav, Amit and Tejaswini) for such a memorable and beautiful pics.